Angry Birds are officially going to roost in China after Rovio opened an office in Shanghai, which becomes its first ever international base. The move will see the company target China’s lucrative feature phone market whilst also creating an overseas base which will serve as a platform for future acquisitions, according to company CMO Peter Vesterbacka who is quoted in China Daily. Vesterbacka also added the company had chosen Shanghai “because of its unique position as one of the most creative and technologically advanced cities in the world” while the move will allow it to show its “appreciation” for Chinese fans amongst whom the franchise has become hugely popular. The move is likely to see Rovio click its China marketing campaign into overdrive given the huge potential of the Angry Birds brand in the country. 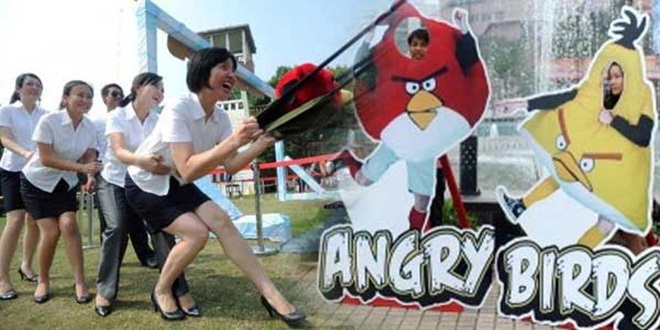 Just last month the company took the unusual step of teaming up with an unofficial Angry Birds theme park which had opened in China, while all manner of fake items have sprouted up across the country – like this 7 inch tablet on Geek.com – demonstrating the huge appeal and potential profits that the company could make in China. And that is without even considering Rovio’s primary focus on the mobile industry. According to China Daily, close to 40 million people in China have downloaded the game. On the business side of thing, Rovio enjoys partnerships with more than 10 Chinese firms, including Internet heavy hitters China Mobile, Renren and Baidu. These three are likely to be significant allies as Rovio plots to extent Angry Birds fever across China and perhaps into other Asian markets too.